I encounter more not less local people as the evening goes on, culminating in my sitting by a lake watching groups of teenagers ride around at breakneck speed. The Old Quarter is a place for both tourists and local people to enjoy the night, it seems. I’ve always been fascinated by big cities. These are places of seemingly endless energy, where the balance between night and day has become distorted by a vibrant nightlife and 24-hour shops and public transport, which has come to typify places like New York, London and Bangkok. Hanoi is different. The city’s energy is dramatically influenced by the time of day. At no time is this more evident than during the midnight hours. It’s a point that might be missed by visitors to the city, who often only stay in the Old Quarter, but large portions of Hanoi are reduced to almost silence late at night, and those that aren’t reflect a very different vibe to the nightlife that can be found in the Old Quarter. Fueled by my own inability to get an early night I took to the streets to document what Hanoi looks like as the clock strikes 12. Midnight in Hanoi tends to be a pretty somber affair. It’s so quiet for a capital city, my friend said to me. And he’s right. We were standing on the sixth-floor balcony of my house in Ba Dinh district, taking in the night from my first vantage point in the city. The chaos and din of too many motorbikes on too narrow roads was gone, replaced by the sound of a single vehicle passing in the distance. A trip out at this time reveals almost empty roads, the occasional shop or beer place still open but looking like it’s about to close, and the sight of other people rare as they go about their business in a hushed manner. The Old Quarter is where the overwhelming majority of travelers to the city end up staying. Its packed streets and winding alleys form most people’s impression of Hanoi at night. 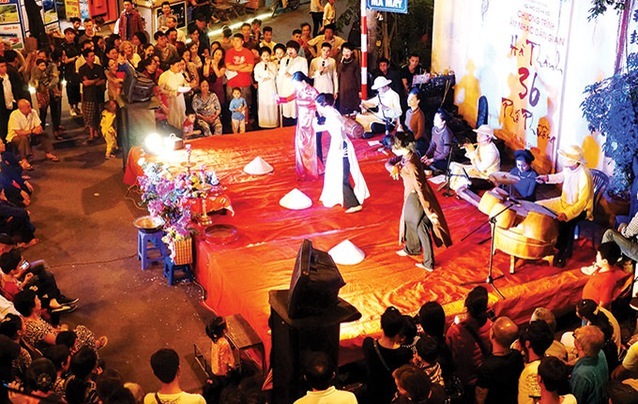 Increasingly it’s a place where young Vietnamese come to enjoy the best the city’s nightlife has to offer. Thanh, who works at a bar in the middle of the action on Hang Buom Street, told me that although the majority of customers are foreign, up to a third are Vietnamese. There are plenty of other Vietnamese people around too, not least the police, who enforce the midnight curfew for which Hanoi is infamous. As midnight comes on my second night I’m at a bia hoi joint when a big horn and a small truck announce the arrival of what one foreigner I spoke to called “Hanoi’s unofficial circus”. It’s telling that many of the staff know only two phrases in English: one the price of a beer and the other police, police. It’s a comment that mirrors my own experience, as I encounter more not less local people as the evening goes on, culminating in my sitting by a lake watching groups of teenagers ride around at breakneck speed. The Old Quarter is a place for both tourists and local people to enjoy the night, it seems. For my final date with Hanoi at night I romantically enough chose a flower market. This is a place that serves as a hub for other flower markets and traders. I wanted to explore the midnight hour at somewhere full of activity, but of a very different kind. Quang Ba flower market is a 20-minute drive from my previous destination and as I approached the roads were virtually deserted. It’s not a particularly large market, but in keeping with Hanoi in general it has a lot packed into a small space, as two rows of shops with little walkways shooting off and an assortment of beer and tea stores create a bustling, lively environment that could be any time of day. Midnight comes and goes with me totally unaware, and the only police presence is a single uniformed officer unwinding from a long day of work over a cup of tea. Hung, a trader who works there, told me how he works the night and goes to sleep at 7am. I find it poignant that he’ll share his bedtime with many of the late-night revelers across town but for totally different reasons. This is a pattern followed across the city, from the fruit market of Long Bien to the various fresh food markets around town that start from the small hours of the night. These are places where the night is alive, but rather than an extension of the old day it is the start of a new one that drives the activity. Hanoi is a city affected dramatically by time of day. It’s unlike other big cities I’ve visited, where a vibrant nightlife and 24-hour shops and restaurants have distorted the day and night and where the nighttime serves to service the day that refuses to sleep. The nights here overwhelmingly seem a place to serve the next day and not the one preceding it. From the quiet slumber of large areas of the city to the small enclaves of market-based activity that are surrounded by them, it’s tempting to say the city has more in common with the countryside than other big cities. The only question is, where does the Old Quarter fit in? 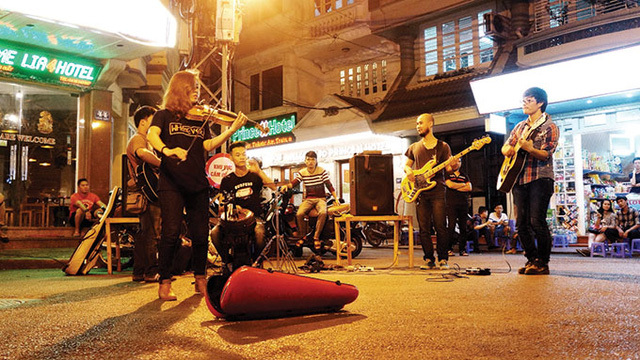 As both the tourist hub and a place where it’s possible to party into the night, the area could be seen as focusing on offering something to foreigners that is foreign to Hanoi; the role of disapproving police only serving to uphold that distinction. On the other hand, with a growing number of Vietnamese going there at all hours it be could be seen as the start of a far bigger shift in the dynamics of the city. It’s a question only time can answer. There’s a host of places to head in Hanoi when you’re keen to get to know someone a little better.